A faster alternative to cold bonding, QuickStick™ is ideal for a flat finish and works particularly well with finer hair types. It is a popular method with time constrained session stylists who want a fast, clean an easy application. 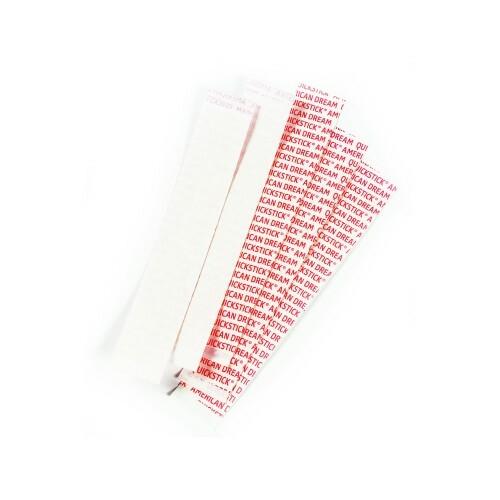 QuickStick™ is a special double-sided adhesive tape that folds over both sides of a weft. Stick one side of the tape to the weft, folding over so both sides of the weft top end is covered. Create your section, and then apply the weft, approximately half a centimetre away from the hairline, avoiding contact with the scalp. QuickStick™ is a temporary solution to apply extensions for special occasions. It’s also a cost effective way for clients to test extensions for the first time and to try a new colour or look, before making a longer-term commitment. Quick Stick can last up to 2 weeks when maintained correctly. So versatile, QuickStick™ can be applied to any hair weft. Alternatively, Qwik X are pre-made remy hair weft pieces where the weft is prepared with the adhesive strip in place on the top end. To remove QuickStick™ Tape use we recommend using our Quickshift™ spray.